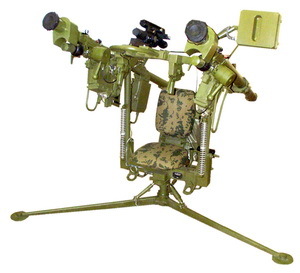 The Dzhigit support launching unit (SLU) is designed for a single operator to mount, aim and launch two Igla or Igla-S MANPADS missiles in salvo or successively at one target. The Dzhigit SLU is a unique launcher capable of firing MANPADS missiles in salvo. When salvo-launched, the missiles ensure increase in target kill probability by 50 percent on the average. easy SLU disassembly into three carrying parts. Number of SLU-loaded missiles, pcs. - set of equipment for SLU and missile load arrangement on various carriers.